Peng Hong, Vice Chairmanm Zhangjiajie Municipal Committees gave a brief presentation on Zhangjiajie National Forest park where the famous Hollywood movie “AVATAR” was picturised. The delegations had a discussions on bilateral scope of tourism. One of the recommendations was to start a direct flight from Hunan Province to India. 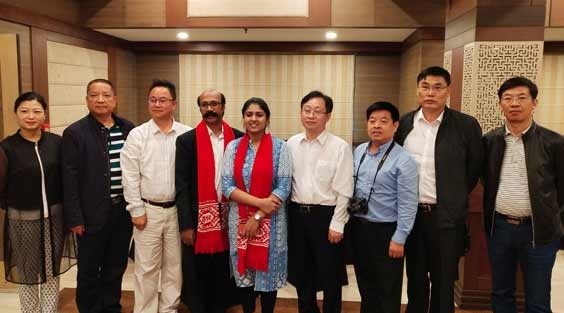 The Chinese delegation said they are planning to promote Indian foods in their Hunan Province. The delegation informed that language is not barrier for visiting Hunan Province as there are lots of English speaking guides there to help tourists. Hunan Province delegates included Zhou Shaungquan, Vice Secretary General, Zhangjiajie Municipal Committees; Chen Haitao, Deputy County Head, Sangzhi County; Zhou Gao, Chairman of Tourism Union; Ou Yueyuan, Director of Yongding District Reform; Li Hong, Vice District Head Wulingyuan District; Zhang Shixiang, Zhangjiajie Municipal Committees.